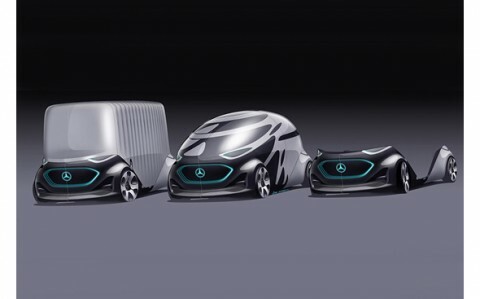 One of Private mobility finalist for Future Mobility of the Year 2019: Concept car Mercedes Vision URBANETIC. SEOUL--(Korea Newswire) February 14, 2019 -- The KAIST Graduate School for Green Transportation announced the establishment of the Future Mobility of the Year (FMOTY) Awards, which will recognize concept cars that have made outstanding contributions to the future of mobility. The first awards ceremony will take place in March 2019. The Awards were created to instill a forward-looking spirit in the existing awards that have been centered around finished vehicles. The awards will be given to concept cars that debut at international motor shows in three categories—Private, Public & Commercial, and Personal. Each of these categories isolates a specific contribution to the innovative services and transportation technologies that shape the future of mobility. The awards are judged by an esteemed panel of motor journalists to ensure a fair judging process befitting for prestigious awards. The panelists will evaluate social values and innovative contributions of concept cars to fuel the next development of future cars. 15 finalists from Audi, BMW, Mercedes-Benz, Peugeot, Porsche, Renault, Toyota, Volkswagen and Volvo have been shortlisted among the 45 concept cars that made the initial cut in 2018. The winner will be determined and announced at the awards ceremony in late March in Seoul. Concept cars have long been excluded from existing auto awards such as “Car of the Year,” as they have been viewed as strictly experimental prototypes built to showcase an automaker's new vision for a far-flung future. As the first-of-its-kind, the FMOTY Awards are expected to evolve into the most prestigious event of its kind that shines a spotlight on the best ideas and values of mind-blowing concept cars. Details can be found on the official website of FMOTY (www.fmoty.org), where photos of the finalists are also available for download (http://bitly.kr/JTUUp). The KAIST Graduate School for Green Transportation has been founded to produce the world's top transportation specialists who develop sustainable transport technologies and take the lead in the future car industry. ▶Private mobility: Volvo, BMW, Audi, Mercedes-Benz, Peugeot, Renault, Porsche, (8 models).